After thirty years of development, Studio Liverpool closes to let Sony focus on other projects. Following other recent industry shakeups at both OnLive and PopCap, Sony has officially shut down Studio Liverpool, formally known as Psygnosis, in an attempt to focus its attention and resources toward the projects of other studios currently under its umbrella. 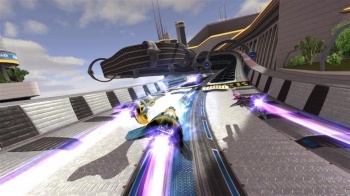 Studio Liverpool, perhaps best known for its work on popular racing series Wipeout, closes after 28 years since its founding, and 19 years since its acquisition by Sony. "As part of SCE Worldwide Studios, we do regular reviews to ensure that the resources we have can create and produce high quality, innovative and commercially viable projects in an increasingly competitive market place," Sony explained in an official response to the closure. "As part of this process, we have reviewed and assessed all current and planned projects for the short and medium term and have decided to make some changes to our European Studios. "It has been decided that Liverpool Studio should be closed. Liverpool Studio has been an important part of SCE Worldwide Studios since the outset of PlayStation, and have contributed greatly to PlayStation over the years. Everyone connected with Liverpool Studio, past and present, can be very proud of their achievements." Prior to the decision, Psygnosis/Studio Liverpool had been responsible for numerous popular games spanning back to the 1980s, including Commodore 64 hit Barbarian, Amiga puzzler Lemmings, and PlayStation 2 racer Formula One. Sony has confirmed that while the Studio Liverpool team has been disbanded, the rest of the studio (focusing primarily on software, localization, and administrative tasks) will remain intact.